Materials were collected by Carolyn Hegberg, who donated them to the Archives in 2016-2017. 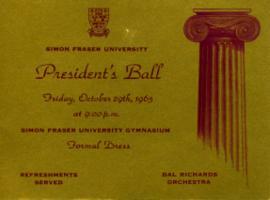 Collection consists of four items relating to the early history of Simon Fraser University: a copy of the program for the university's opening ceremonies on September 9, 1965; an invitation and ticket to the President's Ball held in October 1965; and a copy of the first SFU Yearbook (1965-66). Collection is arranged into three files. Analogue originals were digitized by the archivist in May 2017. Preservation copies were made as tiff files (each page a separate tiff). Scanning resolution was calculated to produce a tiff with 4000 pixels on the longest side. PDF copies were then made as the access copies. 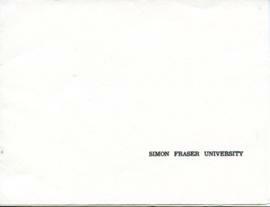 The PDFs are directly available online in SFU AtoM; the preservation copies are available on request. Files are open with no restrictions. Materials in the collection are copyright-protected and copyright ownership is mixed. 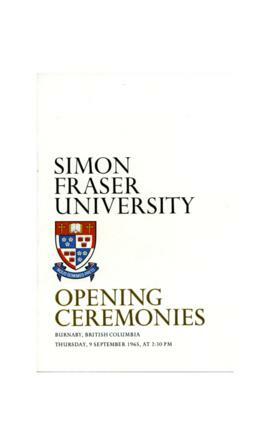 The Archives makes SFU-owned works made available under Creative Commons License CC BY-NC (Attribution-NonCommercial); for license details, see https://creativecommons.org/licenses/by-nc/4.0/. For works whose copyright is not held by SFU, use of copies may require permission of the copyright owner. See individual file descriptions for details.